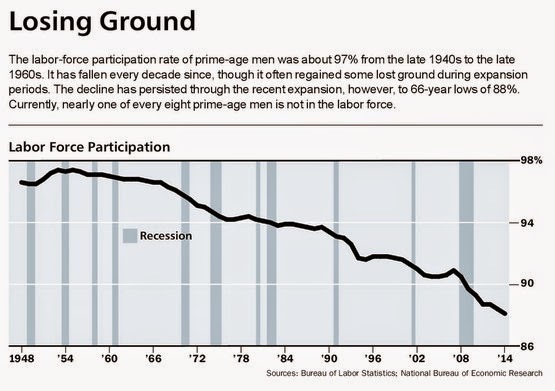 And evidence exists that some of these men may be doing any of a combination of the following: living off loans and stipends that support them through college and professional school; using credit-card debt to cover living expenses; relying on spouses for support; working sporadically in the above-ground economy, or living off crime. 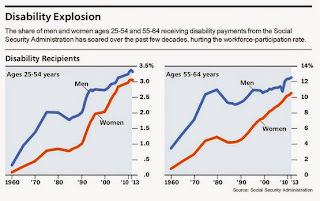 WHEN IT COMES TO the millions of people receiving Social Security disability income, however, it is fairly certain that virtually all of them are outside of the labor force. 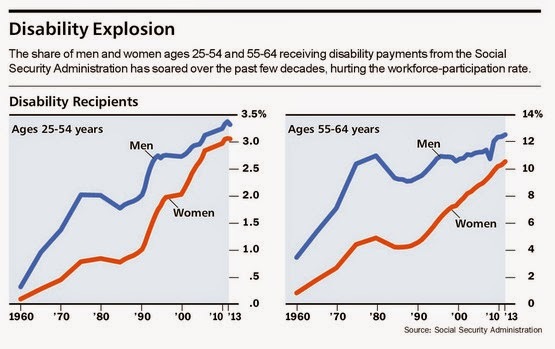 The SSDI program "creates a very strong incentive against meaningfully participating in the formal labor market," says Massachusetts Institute of Technology economics professor David Autor, author of the November 2011 study, "The Unsustainable Rise of the Disability Rolls in the United States." The reason is simple: If you take a job, you run the risk of being terminated from the program and losing the benefits. It always comes back to incentives. As "Uncle Miltie" Friedman said about 50 years ago, "We economists don't know much. But we do know two things: if you want more of something, subsidize it, it you want less of something, penalize it". What is the surprise here?